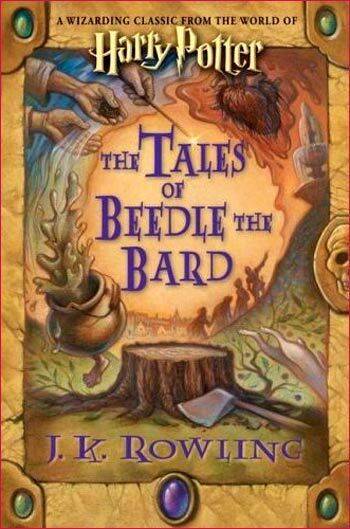 The Tales of Beedle the Bard is the newest accessory in the land of Harry Potter. It is a book of five wizard-children’s fairy tales, mentioned first in Harry Potter and the Deathly Hallows. The five stories are “The Wizard and the Hopping Pot,” “The Fountain of Fair Fortune,” “The Warlock’s Hairy Heart,” “Babbitty Rabbitty and her Cackling Stump,” and “The Tale of the Three Brothers.” The last of these was already written out in the aforementioned HPatDH. Each story is followed by commentary by Albus Dumbledore, and there are some interesting footnotes as well (I now finally know the difference between a Warlock and a Wizard). J.K. Rowling has a real talent for fairy tales, mythology, and other such similar topics. These were fantastic. They mirrored the sorts of fairy tales one hears in real life – Snow White, Cinderella, Little Red Riding Hood – in archetypal quality and tonal lilt. Though the plots are uniquely their own, not at all like Snow White or Cinderella, the same under-qualities are there, the same types of morals. These were very fun to read through. I zipped through them this morning after my book arrived around 9:45 pm last night. Dumbledore’s commentary was equally fun, especially his footnotes. My favorite was “The Fountain of Fair Fortune.” It was the most fairy-tale of them all, had the greatest moral value in my opinion, and was just plain fun. This book wouldn’t make much sense, probably, to those who aren’t already Harry Potter fans, but for those who are, this is worth purchasing. Also, a certain amount of the proceeds go towards charity (just like with Rowling’s other encyclopedic HP accessories, Quidditch Through the Ages and Fantastic Beasts and Where to Find Them). In this case, the charity is one that benefits children living in institutions. Good cause, good book. Well worth the buy/read. This entry was posted in 2008, Children's, Prose and tagged collection, Harry Potter, speculative. Bookmark the permalink.